Copyright © 2013 Motoh Mutsuga et al. This is an open access article distributed under the Creative Commons Attribution License, which permits unrestricted use, distribution, and reproduction in any medium, provided the original work is properly cited. A testing method for N-nitrosamines and N-nitrosatable substances in rubber teats and soothers was modified. N-Nitrosamines are generally analyzed using either a nitrogen chemiluminescence detector (NCD) or a thermal energy analyzer (TEA). However, because few testing laboratories are equipped with these devices, it is difficult to conduct these tests. Therefore, an analysis method for N-nitrosamines using the more widespread gas chromatography-mass spectrometry (GC-MS) method was improved. In addition, EN 12868 was used to prepare the test solutions because of its worldwide use and compliance with EU regulations. Using GC-MS, EN 12868 method targeting ten kinds of N-nitrosamines was modified. The determination limits of the method were 1.0 - 1.5 μg/kg for N-nitrosamines and 4 - 6 μg/kg for N-nitrosatable substances. Quantification was possible at 1/5 or less and 1/15 or less, respectively, of the regulation values listed in EU Directive 93/11/EEC. In terms of application, there were no problems with the selectivity of the detector. The recoveries were 58% - 109% for N-nitrosamines and 59% - 102% for N-nitrosatable substances. Screening and verification were possible by measuring the amount of secondary amines in the boiled solution and migration solution. N-nitrosamines are chemical compounds with N-nitroso groups (>N-N=O), some of which are considered problematic because they are carcinogenic. The International Agency for Research on Cancer (IARC) classifies N-nitrosodimethylamine (NDMA) and N-nitrosodiethylamine (NDEA) in Group 2A (probably carcinogenic to humans) and N-nitrosodipropylamine (NDPA), N-nitrosodibutylamine (NDBA), N-nitrosopiperidine (NPIP), N-nitrosopyrrolidine (NPYR), and N-nitrosomorpholine (NMOR) in Group 2B (possibly carcinogenic to humans) . Furthermore, N-nitrosodibenzylamine (NDBzA), N-nitroso N-methyl N-phenylamine (NMPhA), and N-nitroso Nethyl N-phenylamine (NEPhA) have been reported to be mutagenic [2-5]. Dithiocarbamic acids and thiurams are added to rubber products as vulcanization accelerators in the production process and decompose to form secondary amines. In addition, diphenylamine-type secondary amines are some times added as antioxidants. When some of them react with nitrogen oxides such as nitrous acid, which occurs in the environment or during the manufacturing process, N-nitrosamines are formed. Secondary amines migrating from rubber products may also react with nitrous acid in the stomach to form N-nitrosamines. For rubber teats and soothers, EU Directive 93/11/ EEC limits the total migration of N-nitrosamines to 10 μg/kg or less and the total migration of N-nitrosatable substances to 100 μg/kg or less . Furthermore, the American Society for Testing and Materials (ASTM) F1313-90, the prevalent standard in the US, limits the inclusion of N-nitrosamines to 10 μg/kg or less per chemical compound, with the total amount not exceeding 20 μg/kg . In contrast, the Food Sanitation Law in Japan sets no distinct standards for N-nitrosamines and N-nitrosatable substances. EN 12868, which is based on the EU Directive, and ASTM F1313-90 are the most generally used testing methods for N-nitrosamines in rubber teats and soothers. EN 12868 is a test that targets 11 kinds of N-nitrosamines and uses artificial saliva for migration. The amount of Nnitrosamines and N-nitrosatable substances in the migrated solution are then measured . On the other hand, ASTM F1313-90 is a material test in which the sample is homogenized by adding liquid nitrogen and then subjected to Soxhlet extraction with dichloromethane. The amount of N-nitrosamines in the material is then measured. Many researchers have analyzed the N-nitrosamine content of teats and soothers [9-19], and all of these analyses have been conducted using one of the two methods mentioned above, or a modified version of them. With these methods, either a nitrogen chemiluminescence detector (NCD) or a thermal energy analyzer (TEA), which has very good sensitivity and selectivity in terms of detecting N-nitrosamines, is necessary. However, in Japan these devices are not widespread, and few testing laboratories have them. In recent years, the headspace solid phase microextraction gas chromatography-MS (HS-SPME-GC-MS), GCnitrogen phosphorus detector (GC-NPD) and liquid chromatography-tandem mass spectrometry (LC-MS/MS) technique have been reported [20-24]. Following this, we have attempted to use the widespread GC-MS method to analyze N-nitrosamines in rubber teats and soothers. EN 12868 was chosen as the test solution preparation method because it is in line with EU regulations and is widely used around the world. A testing method was improved for N-nitrosamines and N-nitrosatable substances in rubber teats and soothers. Furthermore, a screening and verification method using liquid chromatography (LC)-MS (LC-MS) was developed. A 2.3 mm thick isoprene rubber sheet was used. Its composition is followed. zinc oxide 0.5 phr (per hundred rubber), stearic acid 0.5 phr, sulfur 1 phr, zinc dimethyldithiocarbamate, zinc diethyldithiocarbamate, zinc dibutyldithiocarbamate, zinc N-pentamethylene dithiocarbamate, zinc dibenzyldithiocarbamate, zinc ethylphenyl dithiocarbamate, and N-oxydiethylene-2-benzothiazolesulfenamide 0.2 phr each for polyisoprene rubber. Samples of teats made from silicone rubber, isoprene rubber, and natural rubber purchased from retail stores in Tokyo were used. N-Nitrosodimethylamine (NDMA, ≥98% purity), Nnitrosodiethylamine (NDEA, ≥98% purity), N-nitrosodipropylamine (NDPA, ≥98% purity), N-nitrosodibutylamine (NDBA, ≥95% purity), N-nitrosomorpholine (NMOR, ≥98% purity), and N-nitroso-N-methylaniline (NMPhA, ≥98% purity) were purchased from Tokyo Chemical Industry Co., Ltd., N-nitrosodibenzylamine (NDBzA, ≥99% purity) was purchased from Wako Pure Chemical Industries Ltd., N-nitrosopiperidine (NPIP, ≥95% purity) was purchased from Sigma International Ltd., N-nitrosopyrrolidine (NPYR, ≥98% purity) was purchased from Aldrich Chemical Co., N-nitroso N-ethyl N-phenylamine (NEPhA, ≥98% purity) was purchased from Toronto Research Chemicals Inc., and N-nitrosodiisopropylamine (NDiPA, ≥95% purity) was purchased from LGC Standards. Dimethylamine hydrochloride (DMA, ≥99% purity), diethylamine (DEA, ≥99% purity), dipropylamine (DPA, ≥99% purity), dibutylamine (DBA, ≥99% purity), piperidine (PIP, ≥99% purity), pyrrolidine (PYR, ≥98% purity), morpholine (MOR, ≥99% purity), dibenzylamine (DBzA, ≥97% purity), N-methylaniline (MPhA, ≥98% purity), and N-ethylaniline (EPhA, ≥99% purity) were purchased from Tokyo Chemical Industry Co., Ltd. The internal standard stock solution consisted of 10 mg of NDiPA dissolved in hexane to 100 mL (100 μg/ mL). The internal standard solution was made by diluting the internal standard stock solution to 0.2 μg/mL with acetone. The N-nitrosamine standard stock solutions were prepared by dissolving 20 mg each of the N-nitrosamines separately in acetone to make 20 mL each. Next, 5 mL of each solution was diluted to 100 mL with hexane (50 μg/ mL). The N-nitrosamine standard solutions consisted of internal standard stock solution added to the N-nitrosamine standard stock solution, appropriately diluted with hexane so that the N-nitrosamines concentration was 0.01 - 10 μg/mL and that of the internal standard was 0.2 μg/ mL. The secondary amine standard stock solutions were prepared as followed. Each 50 mg of secondary amines (except for DMA, of which 90.6 mg was used because it is a hydrochloride) was dissolved separately in methanol to 50 mL. Next, 1 mL of each solution was diluted to 20 mL with water (50 μg/mL), and then further diluted to 0.05 - 5 μg/mL with artificial saliva. The secondary amine standard solutions were prepared by adding 0.1% trifluoroacetic acid (TFA) to 2 mL of the secondary amine standard stock solution at each concentration level to make 10 mL (0.01 - 1 μg/mL). Artificial saliva was prepared by dissolving 4.2 g sodium bicarbonate, 0.5 g sodium chloride, 0.2 g potassium carbonate, and 0.03 g sodium nitrite in 950 mL of water, then adjusted to pH 9 with 0.1 mol/L NaOH, and diluted to a total volume of 1000 mL with water. The GC-MS analysis was performed with an Agilent 6890N gas chromatograph and 5973 inert mass spectrometer (Agilent Technologies). GC conditions were as follows: column: DB-FFAP (0.25 mm internal diameter, 15 m length, 0.25 mm film thickness; Agilent Technologies); column temperature: 50˚C - 10˚C/min - 160˚C - 20˚C/min - 250˚C (2 min); injection volume: 1 μL; injection port temperature: 120˚C; transfer line temperature: 250˚C; ion source temperature: 230˚C; carrier gas: He at a flow rate of 1.0 mL/min; split ratio: 1:1; ionization voltage: 70 eV (electron impact mode); measurement mode: selected ion monitoring (SIM). The LC-MS analysis was performed with an Acquity Series LC-MS, Waters Corporation. 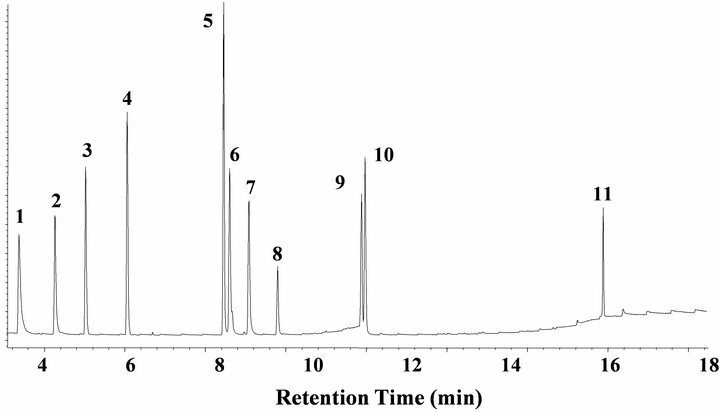 The LC-MS conditions were as follows: column: Acquity BEH C18 (100 mm × 2.1 mm, 1.7 μm particle diameter); column temperature: 40˚C; mobile phase: A, 0.1% TFA; B 0.1% TFA/ methanol, A:B (99:1) (1 min) ® linear gradient (6 min) ® A:B (1:99) (3 min); flow rate: 0.3 mL/min; injection volume: 10 μL; method of ionization: electrospray ionization (+); capillary voltage: 3 kV; ion source temperature: 150˚C; cone gas and flow rate: N2 50 L/h; measurement mode: single ion recording (SIR). For the boiled solution, each sample (10 g) was accurately weighed and immersed in a minimal amount of water and boiled for 10 min. After removing the sample, water was added to make 100 mL. For the migration solution, the sample was cut vertically into two pieces and left to dry naturally overnight. Next, 80 mL of artificial saliva was added and the sample was left for 24 h at 40˚C in the dark. This solution was transferred into a 100 mL measuring cylinder, and the sample was washed with 10 mL of artificial saliva and added to the washings in the measuring cylinder, which was finally made up to 100 mL with artificial saliva. Using the boiled solution and migration solution, the following test solutions were prepared. N-Nitrosamine test solution was prepared as follows. 75 mL of either boiled solution or migration solution was transferred into a separating funnel, 1 mL of the internal standard solution, 2 mL of 1 mol/L NaOH and 20 mL dichloromethane were added, and the funnel was shaken vigorously. The dichloromethane layer was separated from the upper layer, which was subsequently extracted using 20 mL of dichloromethane. The combined dichloromethane layers were dried using sodium sulfate, and 2 mL of hexane was added. The solution was concentrated at ≤35˚C to slightly less than 1 mL. Hexane was added to fix the volume at 1 mL. The N-nitrosatable substance test solution was prepared as follows. 2 mL of 1 mol/L HCl was added to 20 mL of migration solution. The solution was shaken vigorously, then left in the dark for 30 min. Next, the solution was transferred into a separating funnel and 1 mL of internal standard solution, 4 mL of 1 mol/L NaOH and 10 mL dichloromethane were added. After vigorous shaking, the dichloromethane layer was separated from the upper layer, which was subsequently extracted using 10 mL of dichloromethane. The combined dichloromethane layers were dried using sodium sulfate, and 2 mL of hexane was added. The solution was concentrated at ≤35˚C to slightly less than 1 mL. Hexane was added to fix the volume at 1 mL. The secondary amine test solution was prepared by diluting 1 mL of the boiled solution or migration solution to 5 mL with 0.1% TFA. N-Nitrosamines and N-nitrosatable substances were determined using GC-MS with the internal standard method. The migration levels of each N-nitrosamine and N-nitrosatable substance per sample amount (μg/kg) were obtained. The secondary amines in the boiled solution and migration solution were determined using LC-MS with the absolute calibration method. The migration levels of second-dary amine per amount of sample (mg/kg) were obtained. A total of 11 kinds of N-nitrosamines are targeted for analysis in EN 12868: NDMA, NDEA, NDPA, NDBA, NPIP, NPYR, NMOR, NDBzA, NMPhA, NEPhA, and N-nitrosodiisononylamine (NDiNA). Of these, seven kinds are targeted for analysis in ASTM F1313-90: NDMA, NDEA, NDBA, NPIP, NPYR, NMOR, and NEPhA (Table 1). Of the 11 kinds listed in EN 12868, NDiNA and its precursor diisononylamine were not readily available commercially. In this study, ten kinds of N-nitrosamines were targeted for the analysis. Furthermore, a method was established for analyzing the ten kinds of secondary amines that are precursors to these N-nitrosamines (Table 2). N-Nitrosamine standard solutions were analyzed in the SCAN mode and determination ions were chosen from each mass spectrum (Table 1). The determinations were performed in the SIM mode using each determined ion. When the injection port temperature was set to 250˚C, three peaks each were observed for NEPhA, NMPhA, and NDBzA (Figure 1). In these peaks, each precursor amine (EPhA, MPhA, and DBzA) was contained. These amines were assumed to be formed by decomposition at the injection port. The other peaks were thought to be the result of decomposition products or dimers of each amine, but they could not be identified. When the injection port temperature was set to 120˚C, the peaks became singular, their shapes were improved, and the peak intensity increased greatly (Figure 1). For the other N-nitrosamines, no difference was observed between 250˚C and 120˚C, Therefore, the injection port temperature was set to 120˚C. The SIM chromatogram of the standard solution is shown in Figure 2. Under these conditions, the determination limit is 0.005 μg/mL for each (Table 1). The secondary amines that are the precursors to the Nnitrosamines were analyzed by LC-MS. An Acquity BEH C18 column, 0.1% TFA/water and 0.1% TFA/methanol for the mobile phases were used. From the mass spectra of the secondary amines, [M+H]+ was detected as the base peak. Therefore, these were selected as the determined ions. The cone voltage was set at a value such that, for each amine, the peak area of the determined ion would become greatest. The cone voltage, determined ion, retention time, and determination limit are shown in Table 2. Mass chromatograms of the standard solutions are shown in Figure 3. Table 1. N-nitrosamines targeted for testing by EN12868 and ASTM F1313-90. Table 2. Secondary amines (precursors to the N-nitrosamines targeted for measurement). Figure 1. Effect on injection port temperature for SIM chromatogram of NEPhA (1), NMPhA (2) and NDBzA (3). Figure 2. GC-MS chromatogram of N-nitrosamine standard solution. Figure 3. LC-MS chromatogram of secondary amine standard solution. According to EN 12868, migration is conducted with 40 mL of artificial saliva per 10 g of teat/soother, but some samples were found to be not fully immersed. To ensure consistent results, in this study, migrations were conducted using 80 mL, twice the volume as in EN 12868, so that all the samples would be fully immersed in artificial saliva, and then the volume of migration solution was fixed at 100 mL. In addition, in EN 12868, 10 mL of the 50 mL of migration solution was used to test the Nnitrosatable substances, and the rest was used to test the N-nitrosamines. However, for the latter, this could leave some uncertainty in the determination precision. Therefore, in this study, 75 mL of the 100 mL of migration solution was used to prepare the N-nitrosamine test solution, 20 mL for the N-nitrosatable substances, and 1 mL for the secondary amines. Similarly, the volume of NaOH was doubled and HCl was added. Recovery tests were carried out in four trials for each concentration and performed by spiking in the migration solution from the silicone rubber and isoprene rubber teats (Teat 1 and Teat 2, respectively) as shown in Tables 3 and 4. The recovery rates were calculated for each using both the internal standard and absolute calibration methods. Table 3. Additional recovery rates and determination limits for N-nitrosamines. Table 4. Recovery rates and determination limits of N-nitrosatable substances. When the absolute calibration method was used, the N-nitrosamines recovery rates were 70% or less, except for NMPhA and NDBzA. The recovery rates for Teat 2 were generally lower than those for Teat 1. On the other hand, when the internal standard method was used, the recovery rates of NDMA were 63% and 58% for Teats 1 and 2, respectively. For the others, the rates were 79% - 109% with standard deviations of 1% - 9%, which are better than the results from the absolute calibration method. The recovery rates for each of the N-nitrosatable substances showed an almost identical tendency to those of the N-nitrosamines, ranging from 45% to 79% for Teat 2. Moreover, the standard deviation of Teat 1 was large. When the internal standard method was used, the rates for NDMA were low at 69% and 59%, but for the others, the rates ranged from 79% to 102%. The standard deviation was small at 1% - 7%, and the difference between samples was also small. On the basis of the results described above, each N-nitrosamine and N-nitrosatable substance was determined using the internal standard method. The determination limit for each N-nitrosamine and Nnitrosatable substance was set as the amount that could reasonably be determined on the basis of the recovery rate arising from the determination limit of the standard solution and the absolute calibration method (Tables 3 and 4). The determination limits were 1.0 - 1.5 g/kg for the N-nitrosamines and 4.0 - 6.0 μg/kg for the N-nitrosatable substances, indicating that for each, determination was possible for up to 1/5 or less and 1/15 or less, respectively, of the EU regulation values. 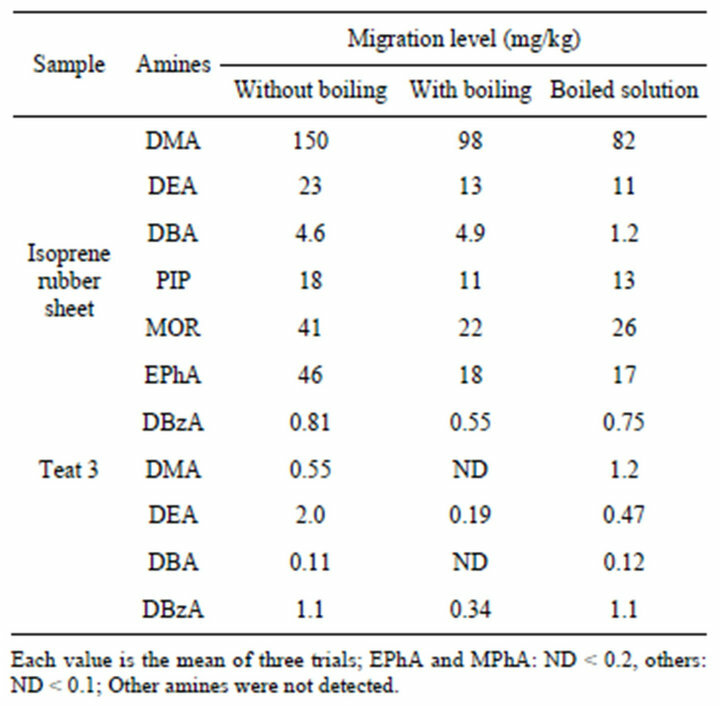 An isoprene rubber sheet manufactured with 0.2% of the vulcanization accelerator that forms NDMA, NDEA, NDBA, NPIP, NMOR, NEPhA, and NDBzA was used for detecting the amount of migration of N-nitrosamines, N-nitrosatable substances, and secondary amines (Table 5). Five kinds of N-nitrosamines were detected at 2.1 - 15 μg/kg, but NDBA and NDBzA, which do not tend to dissolve in water or artificial saliva, were not detected. Six kinds of N-nitrosatable substances were detected at 30 - 17,000 μg/kg, which is 4.5 - 4600 times the amount of N-nitrosamines. All seven kinds of secondary amines were detected at amounts ranging from 0.55 to 98 mg/kg, around 1000 - 25,000 times the amount of N-nitrosamines. 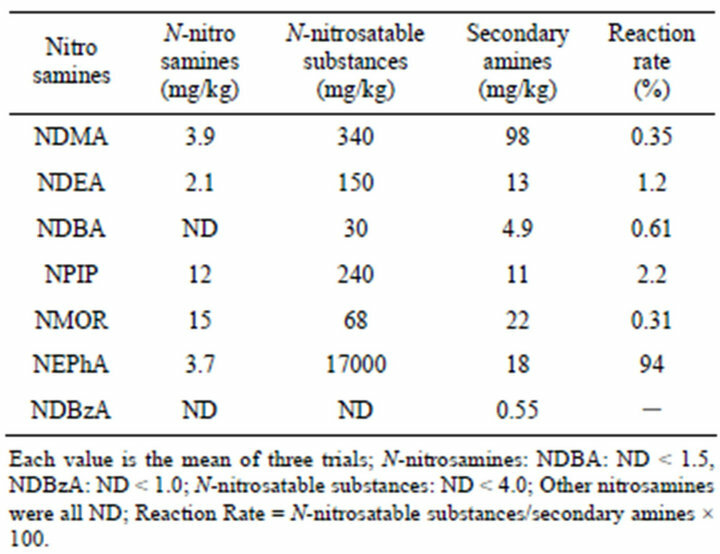 The amount of N-nitrosatable substances indicates the amount of N-nitrosamines that are assumed to be formed from secondary amines in the stomach, but the nitrosation reaction percentage is said to vary greatly depending on the compound [13,17]. In this study, the percentages also varied greatly from 0.31% to 94%. The percentage for NEPhA was especially high, with most of the seconddary amines being nitrosated. Because the reaction percentages varied, the amount of N-nitrosatable substances in the solution was not proportional to the amount of secondary amines. However, except for NEPhA, the amount of secondary amines was around 40 times or more than the amount of N-nitrosamines or N-nitrosatable substances. 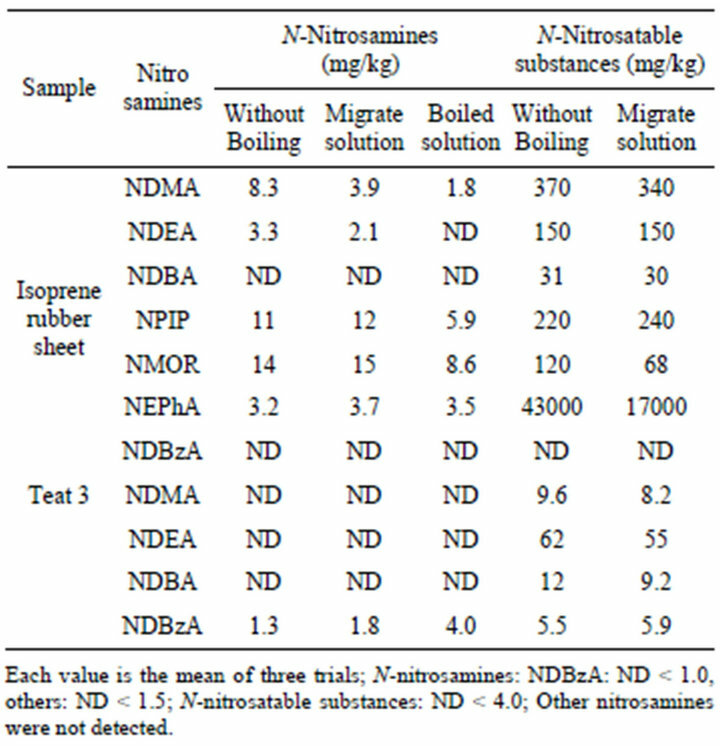 Using the three commercially available teats, the migration level of N-nitrosamines, N-nitrosatable substances, and secondary amines was measured (Tables 6 and 7). Table 5. Migration amounts of N-nitrosamines, N-nitrosatable substances, and secondary amines from rubber sheet. Table 6. Amount of migration (mg/kg) of N-nitrosamines and N-nitrosatable substances from teats. Table 7. Amount of migration (mg/kg) of secondary amines from teats. Of the N-nitrosamines, 1.8 μg/kg of NDBzA was detected from Teat 3. 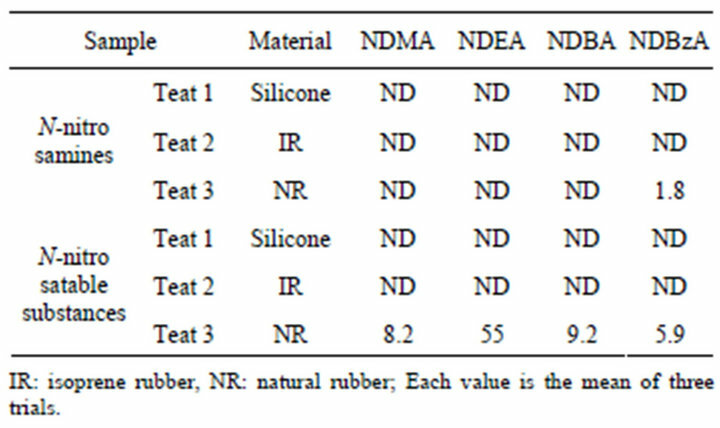 Four of the N-nitrosatable substances, NDMA, NDEA, NDBA, and NDBzA, were also detected from Teat 3 (natural rubber) at amounts ranging from 5.9 - 55 μg/kg, with an especially large amount of NDEA, 55 μg/kg. Of the secondary amines, DEA and DBzA were detected from Teat 3 at 0.19 mg/kg and 0.34 mg/kg, respectively. In addition, 0.41 mg/kg of DBzA was detected from Teat 2, from which no N-nitrosamines or Nnitrosatable substances were detected. No secondary amines were detected from the silicone-rubber-made Teat 1. EN 12868 specifies that, when the test solution is prepared, a sample must be boiled for 10 min in the minimum amount of water in which it can be immersed. According to EN 1400, this boiling process is intended to check the sample’s durability under boiling sterilization and remove the surface coating . During this process, it is possible that N-nitrosamines and secondary amines migrate into the boiling water. Therefore, in this study, an isoprene rubber sheet and Teat 3 were used. In order to confirm the effects of the boiling process, we also analyzed the migration level when the boiling process was omitted. When the rubber sheet was boiled, the N-nitrosamines NDMA and NDEA decreased. Among the N-nitrosatable substances, NMOR and NEPhA decreased. Other than this, the boiling process had no significant effect (Tables 8 and 9). For Teat 3, of the N-nitrosamines, more NDBzA migrated into the boiling solution than into the migration solution. This indicates that NDBzA migrates more easily under boiling conditions, and that the amount of migration increases as well. The N-nitrosatable substances decreased slightly because of boiling, but the change was minimal. The secondary amines, except for the DBA in the rubber sheet, all decreased greatly, indicating that they migrate easily during the boiling process. Secondary amines also migrate in great amounts from articles, and if N-nitrosamines are present in the sample or migration solution, secondary amines are also detected in the boiled solution. The procedure for the secondary amines analysis is simple. Therefore, analyzing seconddary amines in the boiled solution is effective in terms of screening and verification of N-nitrosamines in samples or their migration solutions. Table 8. Effect of the boiling process on the amount of migration of N-nitrosamines and N-nitrosatable substances. Table 9. Effects of the boiling process on the amount of migration of secondary amines. tive 93/11/EEC. This method had no application problems with respect to selectivity of the detector. Additional recovery rates ranged from 58% to 109% for N-nitrosamines and 59% to 102% for N-nitrosatable substances, which are considerably high. Furthermore, screening and verification can be achieved by using LC-MS to measure secondary amines in the boiled solution.